Years ago when I read Dr. Barnard’s book Foods That Fight Pain I remember learning that food intolerances can change. That seems to be very true in my case. When I first started eating this way 7 years ago I couldn’t eat garlic or ginger. Now I eat them every day. Several winters ago, as I was recovering from very low vitamin D levels, I noticed to my dismay that citrus fruit, especially oranges, tangerines, clementines and grapefruit–would make my joints hurt. I was sad to have to stop eating them. This Winter I’m happy to report that I can once again enjoy a bit of orange or clementine. 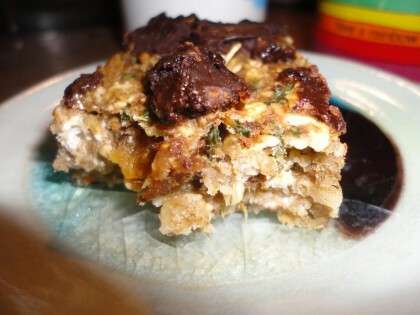 To celebrate that, I’d like to share with you my newest version of banana bars that have been making the rounds on facebook for a couple of years now and recently ended up in the McDougall Friends newsfeed. This version is a little more daring because it combines kale and oranges with the bananas and oatmeal. While the combination might sound unusual, I assure you they are delicious. Although I don’t have to shoot myself out of the cannon in the morning to get to work, I think they would make another great way to chew a healthy breakfast on the go. The carob fudge is optional, but it lends the bars a decadence I wouldn’t want to go without. Add the mandarin orange sections with peel, the pitted chopped date, chopped fig, chopped kale, ground golden flax and 1/4 cup of almond milk to the bowl of your food processor and process until all is small to tiny pieces (you can also add a little bit of the oats to this if you like. In a medium bowl mash the ripe bananas. Mash in the vanilla. Add the oats, the cinnamon and the kale mixture and mix well with a fork until will combined. Press into an 8 x 8 square baking dish. Make the carob fudge by filling a small bowl with anywhere from 1/4 cup to 1/2 cup of carob powder and a healthy sprinkling of ginger powder. Add to that dribbles of almond milk at a time and mix with a fork or spoon until you get a fudgey thick frosting-like consistency. Put dabs on top of the bar batter and spread a little if possible. Bake at 375 for 35 minutes. Let cool for several minutes, then cut into bars and enjoy. These keep well in the fridge. Notes: You could probably make the “fudge” topping with cocoa powder instead of carob, but you might need to add a little sweetener, since cocoa is less sweet than carob. Warning: This “batter” is delicious! It could be eaten raw as a breakfast bowl. I plan to try that out this summer. My approach to reintroducing some citrus has been incremental over the years. Since I had read how the peel has powerful healing properties, I decided to start by adding back lemon and lime zest. Then a little juice in a dressing or as a condiment. For a long time I stayed with these more sour citrus fruits, because they didn’t incite the inflammatory response like oranges and tangerines. Over the last year in my sourdough bread-making internet education, I stumbled across an Italian ciabatta aranciata, which simply means a bread in which a whole orange has been pulverized and added in, peel, pith and all. I was fascinated by that. On further investigation, I discovered that there are lots of recipes for lemon and orange cakes out there that use the whole fruit in the same way. Of course I had to see if my food processor or regular blender would comply. And once I knew they would, I could begin experimenting. I’m happy to say this first experiment was a whopping success, at least in my book of tastes. I’m very happy I can eat some things I didn’t use to be able to eat. Still, I have yet to eat a whole orange or tangerine in one sitting. Instead I prefer to eat a few or a couple of sections at a time, cut up in a salad, as a topping on a treat, or whirred into these bars. And I save the peel, chop it up fine and add it to all kinds of things. So it’s a slow miracle in progress. On the other hand, I seem to have developed a sensitivity to beets. And so the food sensitivity wheel turns, affected by all kinds of forces that also shift in my body and in time. It’s just a matter of paying attention and being willing to experiment a little. Will I ever eat a chocolate beet cake again? Right now it doesn’t seem likely, but if you had asked me a few years ago if I’d be eating tangerines this winter and making my own sourdough spelt bread, I wouldn’t have thought that would be possible either. And even long ago when my food sensitivities seemed most daunting, I was given the grace to be able to ask myself “what can I eat?” instead of complaining “why can’t I eat what I used to eat?” And in the process I discovered a whole world of new taste delights and nutrition. Hi Maria, these bars look great–you know how much I love mixing veggies into dessert! I totally understand the frustration of trying to work with food sensitivities, and I’m glad you brought to my attention that they can change over time. I suppose I knew that at some level, but it’s a good reminder to be aware. I also appreciate the reminder to not get frustrated about what I can’t eat, but to focus on the positive–the blessing of all the things I CAN eat. Thanks! PS – Congrats on reintroducing citrus! Hi Lee–thanks so much! You are quite innovative yourself at mixing veggies into dessert, so I really appreciate your enthusiasm. And yes, food sensitivities are not set in stone always, though they can be quite intractable. And yes, when at all possible, it’s best to focus on the positive–glad the reminder was meaningful to you. And thanks, I sure am enjoying a little citrus this winter!! I think you’re very wise, Maria, to focus on what you *can* eat, rather than dwelling on what doesn’t agree with you. It’s an important shift in mindset. When I first transitioned to veganism five years ago, it felt very restrictive and hard to follow, and now it’s absolutely liberating to eat this way. I’m actually much more “restricted” than I used to be (SOS-free, gluten-free, oat-free, nut-free, flour-free, chia-free), but the minimalist in me is happy with the simplest of meals: rice and beans, potatoes, lentil soup, quinoa salad…nothing fancy. With that said, I do miss oats and would love to be able to eat them without my throat swelling up, but it’s a small price to pay to feel my best! Thank you Lynne! I really enjoyed reading some about your own journey with restricted eating. I’m glad things are working out so well for you. And yes, it’s important–and essential, I would say–to focus on what we *can* eat. I have to have gluten-free oats, but I’m very glad I can eat them, just as I totally understand why you need to steer clear of them. (I think you might be able to make these bars with buckwheat groats, millet or quinoa, or some combination of those, although I would cook the millet of quinoa first, and probably at least soak the buckwheat groats.) Here’s to each of us finding what to eat to feel our best, and honoring the way that can shift around in time. What a lovely recipe this is! I looked at the word fudge and though oh, oh. That’s out then. I read it anyway as I thought I could maybe just leave the topping out. Well, surprise! I have never seen a way like this for doing a lovely topping, ginger (a real favourite) too. 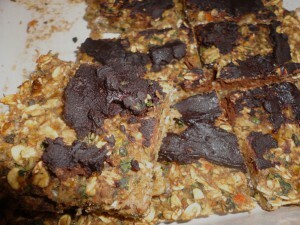 Yes, I love all the ingredients, fruit and oats, carob and ginger….. So good and thank you very much for this is going to be a real treat I can tell you and no guilt involved at all. Nothing to upset weight and careful with my joints. I am really impressed. It is so rare to have a sweet item and NEVER with a topping so this is something I have not had for years. I am looking forward to this, and will have to try out this with kale I cannot taste, how very unusual for I am used to beetroot and black beans but not kale so this is a real first in many ways and at my age too! Thanks Pam– always so nice to hear from you on your travels, and I am looking forward to hearing from you about trying these out once you are ensconced back in a home kitchen! So glad the addition of kale appeals to you. And yes, interesting about how our food sensitivities change. Oh, Maria – I love these! I ate almost the whole pan in one evening. Bad, I know…but, hey, it’s kale, oats, banana and some carob, right?! You come up with the most bizarre combinations that all taste soooo good. Thanks so much for bringing so many wonderful foods to my life: toasted buckwheat groats, germinated oat groats (so crunchy and good frozen), carob ‘frosting’, fresh ginger and the various ‘bowls’ you create. I want to make and eat it all. Everyday :). Oh, have you come across hull-less barley (Whole Foods has it bulk)? Not sure if it is gluten free, but I germinate it like oat groats and keep it in the freezer – chewy and good. This is so creative! Definitely adding to my must try list. Late on, I know, but happy international women’s day to you! Hope you have had something nice to remember! Thank you very much for this unusual recipe, it is always such a treat to pop in and see what you have been I venti g and experimenting with. So inspirational. We all have a very clear and amazingly starry night to gaze upon down south in ireland, yes cold but very beautiful too! I hope you have not been having too much unsafe weather as I know many around the globe are having it very hard just now. I think about them all and hope the equinox changes things for the better and makes things easier. Thank Airfairycelt, and a happy international women’s day back to you too! I am happy to be an inspiration. As far as the weather goes, I’m almost ashamed to admit that here we are having a scandalously mild winter. It’s nearly 60 today, clear, and sunny. It’s a blessing for certain, or at least it is now. We’ll see what summer brings. . .here’s to an equinox that brings more ease to all who are struggling with the difficult weather. Lovely post (and amazing looking bars!). I’ve had to go through various phases of exploratory food eliminations (in order to figure out if I have intolerances) for the sake of my delicate GI system. It’s always hard for me; because of my ED history, I have a very strong resistance to the idea of saying “no” to any food.